Ten unique and penetrating contemporary folk/country originals. Loki's lyrics paint stories and feelings that speak to the heart. One moment reflective and the next full of mystery. Each song creating it's own unique world. Loki Mulholland is an award winning songwriter and filmmaker. "Angel's Lullaby" is a rich collection of stories. "Curtis Jones" is a mystery of man who gets into trouble south of Canyon Lands while "Dead Man's Gun" is a story, in the end, about the pride we carry with us. 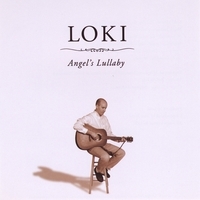 The title track, "Angel's Lullaby" is a heartwarming lullaby to one of Loki's daughter. "What you put into an album as a listener is what you get out of it," says Loki Mulholland, "Each instrument and word plays a part. 'Angel's Lullaby" isn't overly produced. In the end we wanted the meaning of the song to get through and not be cluttered with too many distractions." Recorded in Utah, "Angel's Lullaby" reflects a hint of Southwestern motifs both in lyrics and style.